There is nothing more precious than a bunch of two week old puppies. They are playful, cuddly, inquisitive, and soft. During this time period the puppies will still be with their mother. If the mother dog has fleas, you can be pretty sure she is going to pass it on to those adorable puppies. Since the puppies are so young, they cannot take prescription medication to get rid of the fleas. Still, you don't want to sit back and watch the puppies suffer and constantly scratch at their fur. 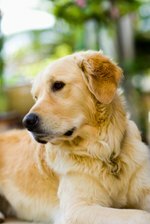 There is something you can do to get rid of those fleas that won't harm the puppies at all. Fill a bowl with warm water and a teaspoon of dish soap. Then gather a napkin and a flea comb. Flea combs are sold at all pet stores. Sit the puppy on your lap and dip the comb in the soapy water. Then comb the puppy's hair from the skin on out. Make sure to wipe the comb off after each strand of hair. Do this with each puppy to remove the fleas that are on the puppy. Begin repelling the fleas in your area by spreading cedar shavings and pine needles around your house and property line. Fleas hate the smell and won't come near it. Make a homemade flea spray. Fill a spray bottle with water. Add four drops each of cedar wood oil and lavender oil to the spray bottle. Shake the bottle up and spray your puppies with this solution three to four times per day. It is totally safe and will get rid of any remaining fleas.